In January, The Quilter’s Planner hosted a month long photo challenge on Instagram. On January 16th, for the photo prompt “Sketch”, I drew out a mini quilt design (click on the link to see my original sketch). Today, I get to share with you the finished mini quilt that was made based on that sketch! I call this mini quilt “Transparency Candy” because the shapes of the purple remind me of a candy with a twisted candy wrapper. 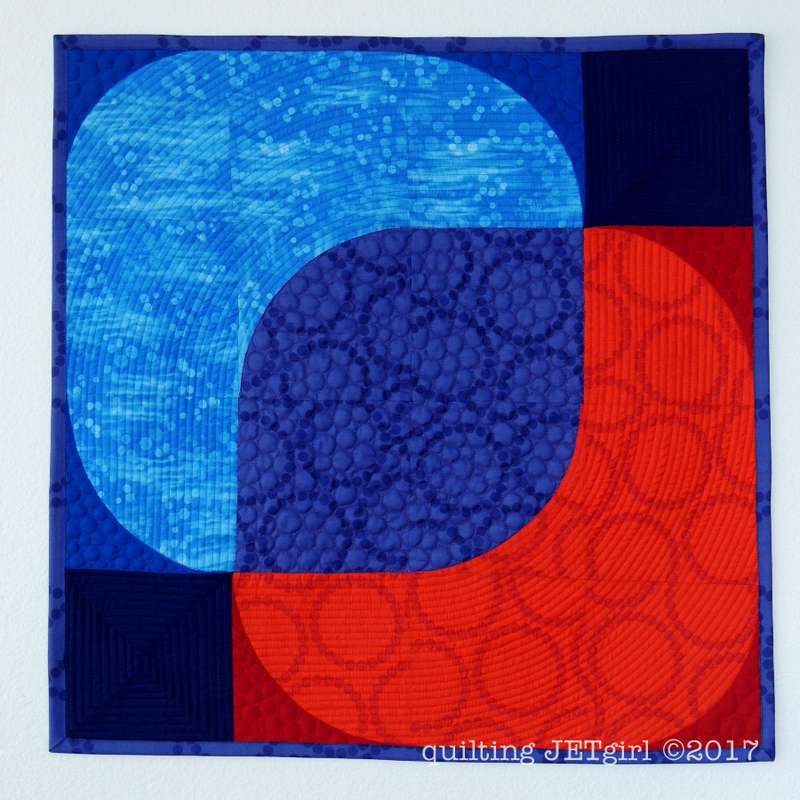 This mini quilt was made as a Patreon reward, and my patron requested that I do something with transparency but perhaps instead of layering a color tone to mix primary colors to create a secondary color. Which is another fun way of playing with a transparency design and one I had been hoping to explore, so this was a really fun mini quilt to design, make, and create! Picking fabric from my stash for this mini quilt was a bit challenging. I wasn’t in love with my all solids pull, and my all print fabric pull did not have enough contrast between the dark and light tones. Several people suggested doing a combination of solids and prints (including from the patron who is receiving this quilt), and once I allowed myself to blend solids and prints, I was much happier with the final fabric pull. The back of the mini quilt is another purple print from my stash, and I added hanging tabs to all four corners so that the recipient can orient the quilt in whatever manner she finds pleasing. I machine stitched on the binding using more 50wt Aurifl 4225 (Eggplant). I am totally inspired! It’s awesome! The quilting brings a lovely flow to the piece. I think the combination of prints and solids is great. This is just gorgeous! I actually have some of that purple backing fabric myself! The quilting you did adds so much too the piece without being distracting. I have never really played with transparency in any way. You seem to have mastered it and give me hope to try it one day! Great job and the quilting is wonderful! Wow! After reading your inspiration for the design and color, and seeing this gorgeous quilt, I am now craving some of that purple candy you mentioned as it is a well remembered childhood favorite! What a wonderful quilt! Wow! This is great! Very dramatic and happy at the same time! Yvonne, love the way this turned out. I think this was the perfect choice from the fabric pull selections you posted earlier. It turned out great. I like the mixing of colors. In addition to Jan O’s suggestion, it is fun to try different layer blending modes in Photoshop to see different blending effects. The quilting is great, and I like that you allowed for hanging in any orientation. Your quilting is a perfect finish, and the Pyramid a fitting name. And four hanging corners, what a thought, so it can hang either or any way. Oh, wow! 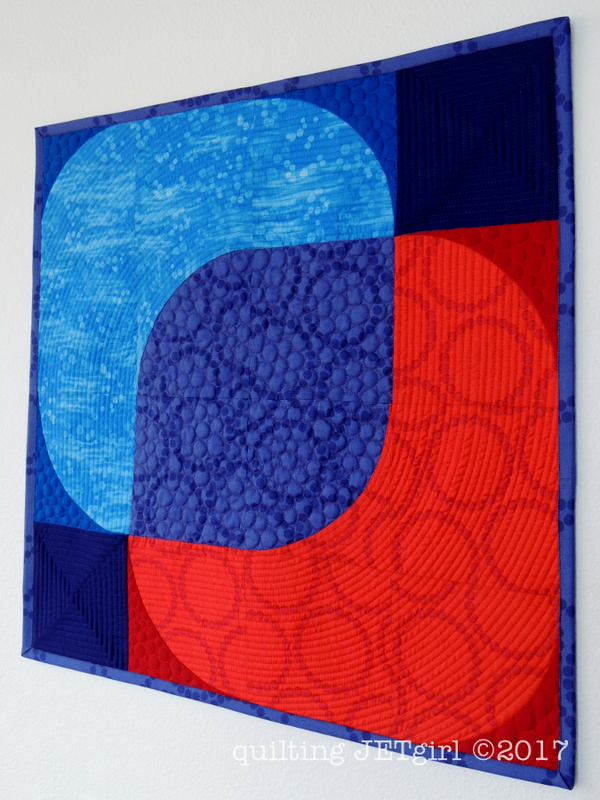 The colors, the quilting… I love everything about this piece!! Such a pretty modern quilt! I love it! Yvonne, this is absolutely stunning. I don’t do much with red and blue but this is definitely a masterpiece. I really love that you mixed prints with solids on this one. The colors down to the quilting just makes the entire piece sing. Congrats on this finish and I’m sure its new owner will LOVE it. Really love the design of your quilt ! I love the mix of prints and solids, and the quilting it awesome!!! That is intriguing! Your patron should be totally pleased. What amazing quilting as always! This is quite a bit bigger than I realized. The transparency worked out very well with the combination of pattern and solids. Very pretty! Love the colors and the transparency affect. You definitely nailed the idea. OK how do you make your quilting lines so perfect! This quilt is another great creation, Yvonne! I always enjoying it when you play around with transparency. In this quilt I particularly like the combination of prints and solids and the way all the prints have some sort of circle pattern – it’s those little details that really lift a piece. This is gorgeous Yvonne! The quilting is fabulous. This turned out so beautifully (no surprise). I really enjoy watching your projects come together. 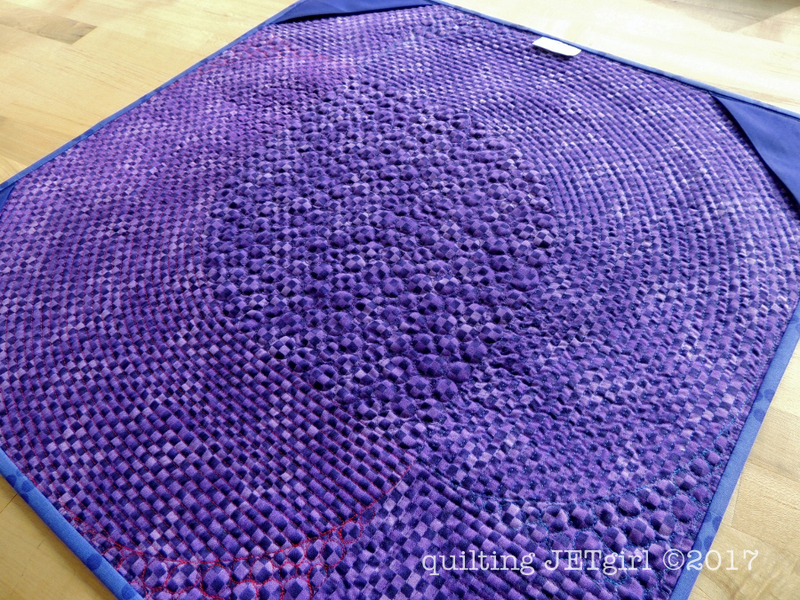 What a great texture you have created by quilting! Neat pattern! What a fun design. 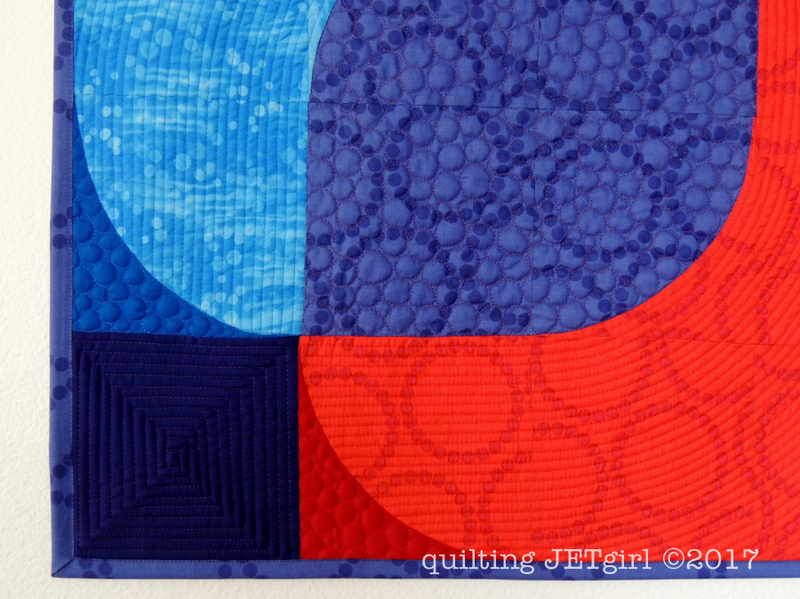 I like the color transparency in your quilt and I love the quilting! Wow. It’s awesome. Another great finish. Love this quilt Yvonne and it’s actually bigger than I thought it was from the IG photos. What a great idea to put hanging corners on all 4 corners!